Tailenders is a running club for bellringers. An increasing number of ringers have been inspired by parkrun to take up middle-distance running, including many who would not previously have imagined they could run 5 kilometres. If you'd like to join Tailenders, please email us with your details and we'll add you to our site. If you know it, please include your parkrun registration number in the email. You can also join Tailenders by registering through parkrun - although still let us know you've done it as we can easily miss new people on the list. Edit your parkrun profile by following the "Manage my profile" link which you get in the weekly newsletter and your run results emails. Then click on "Update". In the "Running club" field there's a dropdown in which you should find "Tailenders" listed. Select this and then scroll to the bottom of the page and click "Please alter". parkrun only allows for people to register themselves against one running club, so if you're already a member of another club you'll still have to email us. You can also find us on Strava and Facebook. Stephanie Rueff is running the Reigate 10k in aid of St Catherine's Hospice on 18th September 2016. You can sponsor her here. Emma and Philip Abbey ran the Hereford Half Marathon in aid of St Michael's Hospice, Hereford. You can sponsor them here. Margaret Gamble ran the London Marathon on 24th April 2016 in aid of The Alzheimers Society. You can sponsor her here. Arthur Reeves ran the London Marathon on 24th April 2016 in aid of Muscular Dystrophy UK. You can sponsor him here. Ewan Hull (13), Henry Pipe (12), Alf Pipe (10) and George Craggs (8) ran a mile every day in November 2015 in aid of Children in Need. They raised almost £1,750. Fantastic effort, boys! Eight Tailenders ran in the Cambridge Town & Gown 10k on Sunday 25th October. They were joined afterwards by Liz Orme and Ewan Hull for a quarter peal of Cambridge Royal at Great St Mary's. Five Tailenders ran in the Queen Elizabeth Olympic Park 10k on Saturday 7th November to warm up for the evening's College Youths' dinner. 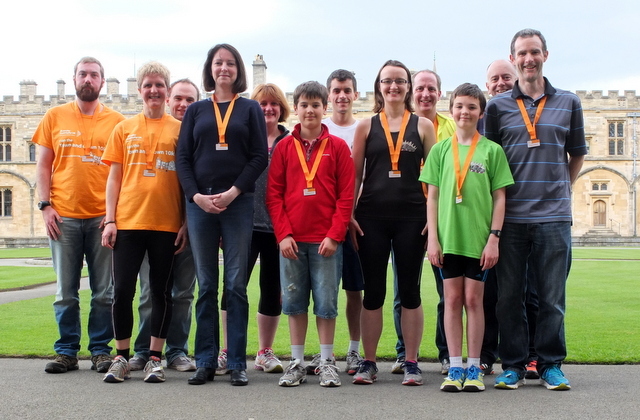 Nineteen Tailenders ran in the 2015 Oxford Town and Gown 10k on Sunday 10th May. Team Tailenders finished joint 7th in the "Large teams" category for Jantastic 2015 - well done everyone! The 45 team members completed 1,323 workouts and our Jantastic score was 96. The band all ran in the Oxford Town & Gown 10km race (*3km junior race) this morning. "Tailenders" is a running club for ringers. Want to improve your parkrun time? You could do worse than read this article. No idea if I’m doing this in the right place, DGH! If not, will you copy and paste to right place please, somebody! Just letting people know that 4 Tailenders boys (Ewan Hull, Henry and Alf Pipe and George Craggs) have decided to raise some money for Children in Need by committing to running at least 1 mile every day of November. I’ve set up a just giving page for donations. If any other youngsters would like to join in the challenge let me know and I can add them in. Still plenty of hours of today left to get the first mile done! First Tailenders quarter – Bristol Max – that’s a standard to set! Service ringing and 10km race at Evesham, 12 July. Emma and I have entered, any other takers? Just helped Christen Evesham Parkrun with Emma and Joseph today. Nice fast flat course. The contraflows will get more interesting as it grows in popularity. Has Robin HALL dropped off the list of participants? Pleased to report that the “This week” and “All-time” pages are now derived automatically from data drawn from the Parkrun database via their API. The pages aren’t dynamic though; a script runs once a week to drag down the data. Exact timing of this will be experimented with to give the most up-to-date picture; currently it runs at around midnight on Saturday. The good news is the Parkrun have released their experimental API and I’ve submitted the paperwork to be an authorised developer, so hopefully the automated results pages will return soon! What if you are a ringer who runs with a club? The AAA get funny if you are registered with 2 clubs and it seems a pity to exclude us all! 27 ringers now registered in the Tailenders Running Club – but still lots who haven’t yet! We’re thinking about getting some club running tops made too – interested? Not much activity these days. Has the bubble burst, or are we fair-weather runners? Team Hall braved the elements en masse this morning. I was there at Finsbury Park this morning, but still injured. Good performances by Becky and Ewan though. I’m in London but we only drove down from Wirral on Friday evening so didn’t really want to get up early enough. I did do a park run (not a parkrun) later in the day. Insanely muddy, windy, wet. Mad. Your red highlighting has gone a bit haywire. The Christmas Day runs aren’t highlighted and some from nearly two years ago are. Looks like any date with 21as the day part is highlighted. Hi guys. A bit late to the party but glad to be here! Some excellent PBs this week – well done everyone! – and welcome Sue Green to the Ringers’ Parkrun club! Yet more impressive PBs today – especially DJP who moves up the Grading ranks with only George Craggs now left to beat! Just as you think you’re getting close, the Nipper from the North steps it up another 3 notches. Come on, MBD; with a bit of effort (and a bit of getting older) I think we can take him! I am going to have to stop letting George read this blog. He’s out in the garden practising his sprint finish for this weekend, now. I blame you, DJP! Good lad! You see what we’re up against, MBD. Get in that garden now! Just as soon as my achilles heals, and I reach the 50+ age grade, and I do some training, and I actually get out of bed on Saturday, and the stars align, and various other preconditions come true… I SHALL BE BEATING YOU ALL! Some impressive PBs today – well done everyone. Hope my leg injury clears up soon! This week’s new Ringing Parkrunner: Andrew Sibson. Well done! The Parkrun website is getting slower by the week: almost 8pm and only 7 ringers’ parkrun results in so far. Good work from Mrs Cansdale though – a PB for the surprisingly tough Finsbury Park course. Easy enough for you MBD – I have to run it in 18:09! An effort you two – you can’t be outdone by a 5 year old! Oh no Kate, we can be outdone by a 5-year-old, quite easily! Five new additions to the list today: Philip Abbey, Mark Eccleston, Arthur Reeves and Maggie and Martin Whiteley. Well done everyone, especially the debutants. A DNF for me this morning – Eliza wanted to have a go, but we only ran less than 2km before we gave up. Congratulations to Eleanor Linford who’s this week’s new Ringing Parkrunner. …and a new picture from the Bradfield ringing course parkrunners. But where was Paul Carless?? A very good question. He was standing behind the camera, looking rather sheepish, refusing to run. Alex Dicks and Chris Griggs didn’t make it back from a wedding in time so hope to have a much bigger turnout next year. Not sure we will ever have a PB there though, tough course and tougher run being beer fueled on a couple of hours sleep. We did Newbury parkrun before the wedding though. I drove a sub-24 pace bus, but beer-carb-loading forced Griggs to adopt a run-walk strategy a bit before the 4km mark. Our times would have still have been good for 2nd & 3rd for the Bradfield parkrun, but I’d never have been able to hang with Flt Lt Hall’s pace. I see another youngster has joined the exclusive 70% club! Good running George Craggs. Wow – I didn’t realise he was that young. Brilliant stuff. Good to see lots of PBs today. Particularly impressed by DGH smashing his PB, and by a very impressive debut from MPAW. Who would have thought any of this this could happen?! And well done Alfie for knocking Embee off his age-grade pedestal. That’s my (god)boy. I must be on drugs. …or taking shortcuts – like I saw 2 girls do at Cannon Hill a couple of weeks ago, I was surprised to pass them twice in quick succession.